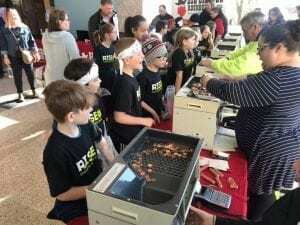 On March 18th third graders from Grand Isle Elementary School brought almost $500 in change to the atrium of UVMMC to be counted by the volunteers at the Big Change Roundup. 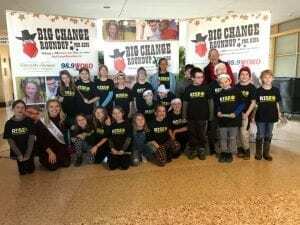 The school’s participation in the Children’s Hospital’s largest fundraiser was inspired and spearheaded by one of its students: Eleanor Wallace-Brodeur. Eleanor was diagnosed with cancer when she was 1 ½ years old. She does not remember much of her treatment this far into her remission; she does remember how the staff and volunteers of the hospital made her feel safe and happy. While her classmates may not understand what she went through, Eleanor wanted them to understand how important their services are to all children and families they care for. 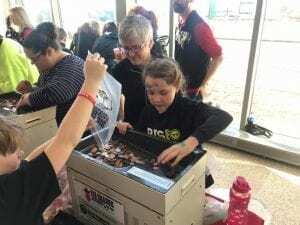 On change collection day, students and teachers wearing RiseVT t-shirts filled the lobby to dump coins in the change counters to watch the totals climb. Tristan thought it was cool watching the money totals rise and to be on the radio (KOOL 105). Tommy said that he saw the total funds raised was over $29,000 when they were there. “It felt nice and kind to be a part of something like that,” he said. Cameron liked posing with the Storm Troopers and other Star Wars characters that were in the lobby welcoming people. Eleanor, who retired from her Hospital Ambassador position years ago, showed her friends pictures of herself from when she was in her position early in her remission. After all the change was counted and pictures taken, the students went to Folino’s Restaurant in Burlington. 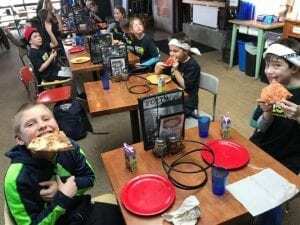 The owner developed a program for schoolchildren to combine two things students love: math and pizza (ok, maybe just pizza). Displayed on a screen was a classroom in Uganda, a recipient of funding from 52 Kids Foundation, a non-profit that the Grand Isle Students support as well. Second grade students regularly Skype with their peers in the school in Uganda, to talk about what each classroom is learning and sports participating in. The conversation at Folino’s engaged the students in everyday application of math problems that they practice in the classroom. If each student gets two slices of pizza, and there are two kinds from which to choose, how many of each 8-slice pizzas must be made to ensure everyone gets what they asked for? There are other calculations regarding the order and what the restaurant needs to consider to keep their customers satisfied. The most satisfying part: everyone ate pizza. Isabel thought math was fun, but what she meant was “it was fun to do math about pizza and then eat it!” Shane said that the math was challenging but “interesting to see the math grown-ups have to do for their work.” Isla thought it was cool helping do some of the work that adults have to do every day. Asking Eleanor if this project turned out like she imagined, she said “I think that this was a big success because of all of the people who donated and thought of all of the sick kids who are in the hospital. Thank you to everyone for all the money that was donated and for the encouragement. Thank you to all of the people at my school like RiseVT, and my principal and teacher who helped us do all of this, and to Folino’s who made dropping off the change more fun and more delicious!” The active third graders have already passed Washington DC. With 1000 more miles to walk, they are setting their sights on Disneyworld in Florida.